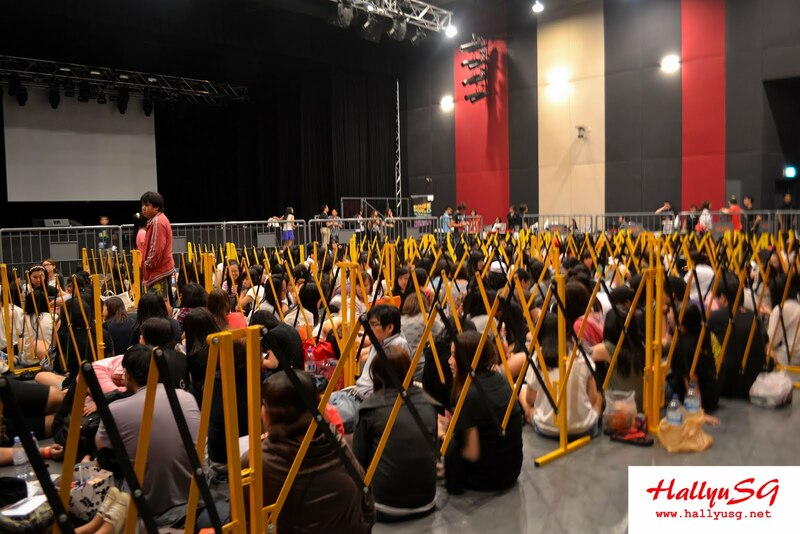 Shawols, otherwise known as the fans of SHINee, have been queuing up since the night of 29th July in hope of getting themselves a good spot for the upcoming concert happening on 10th September. As SHINee will be holding their first solo-concert in Singapore for only one night, fans certainly do not want to miss out this opportunity to catch their favourite idols performing live at the Singapore Indoor Stadium. 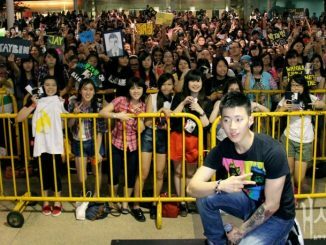 More than 500 fans turned up at *SCAPE on the night of 29th where the ticket sale launch was held at. 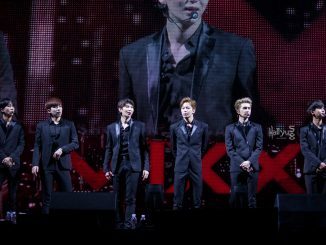 By midnight, there were close to 800 fans who have already gathered at the venue. 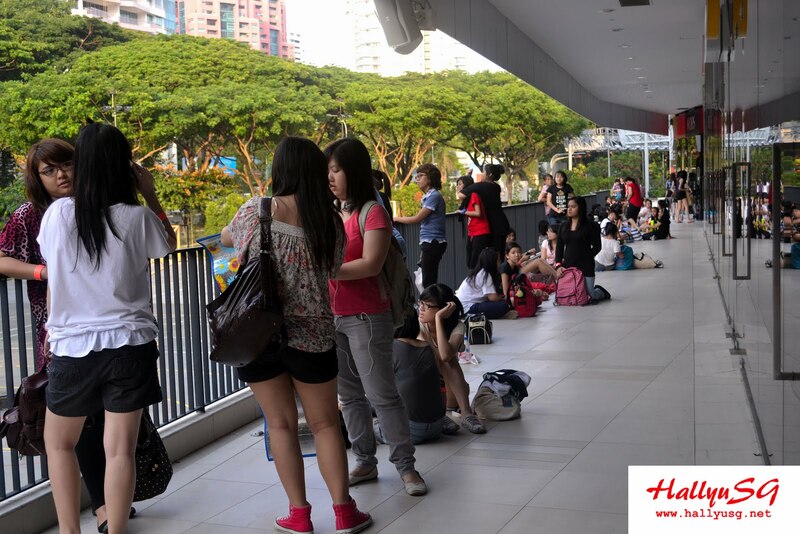 We arrived in the morning of 30th July and were surprised to see almost everyone wide awake, awaiting eagerly and anxiously for the tickets to go on sale at 9am. 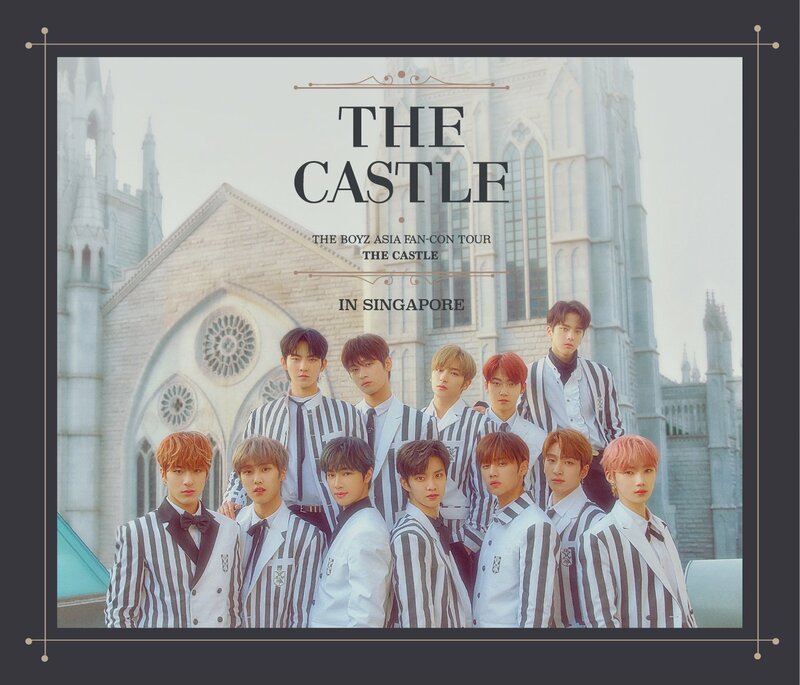 Our team had the opportunity to go around conducting mini-interviews with the fans and found out that many of them have been queuing since 9.30pm the previous day, with some of them as early as 7pm regardless that the official queue will only commence at 11.59pm. 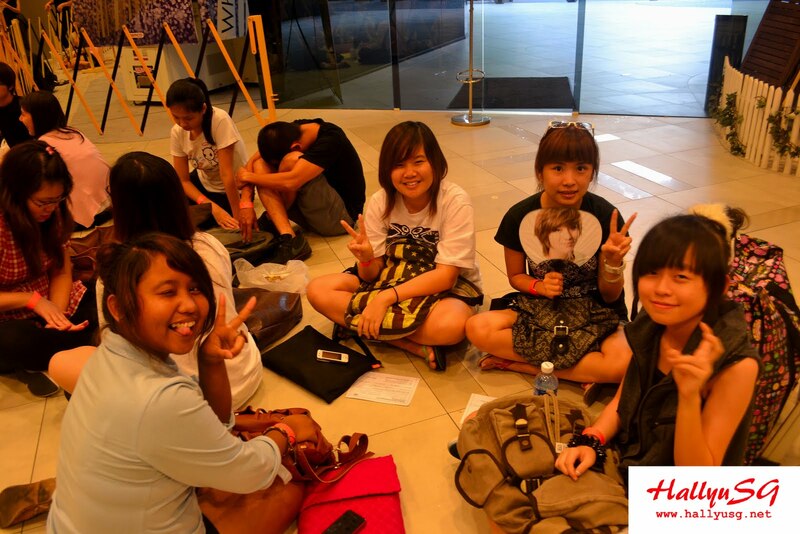 Despite having to queue the entire night for the tickets, there were no major complaints from the fans. 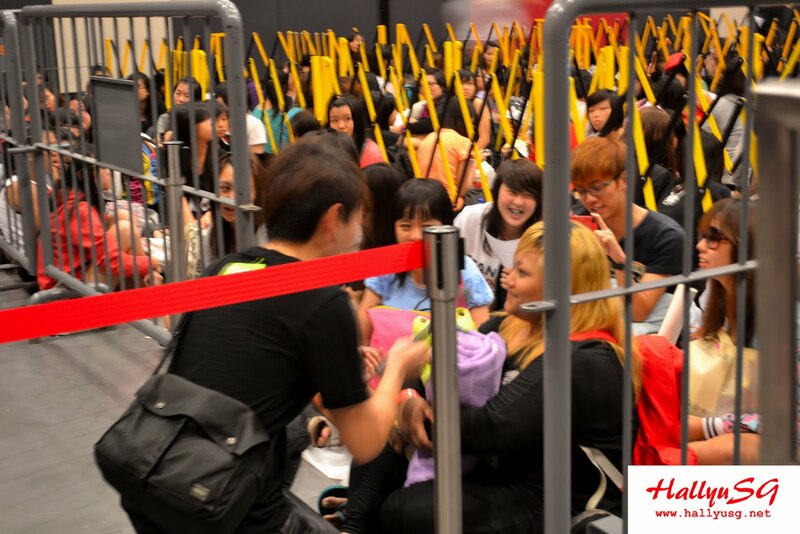 Many have expressed that they were thankful towards RITS for the orderly formation of the queue as well as the F&N canned drinks (official drink sponsor) and SHARE TEA (official bubble tea sponsor) that kept them refreshed throughout the night. 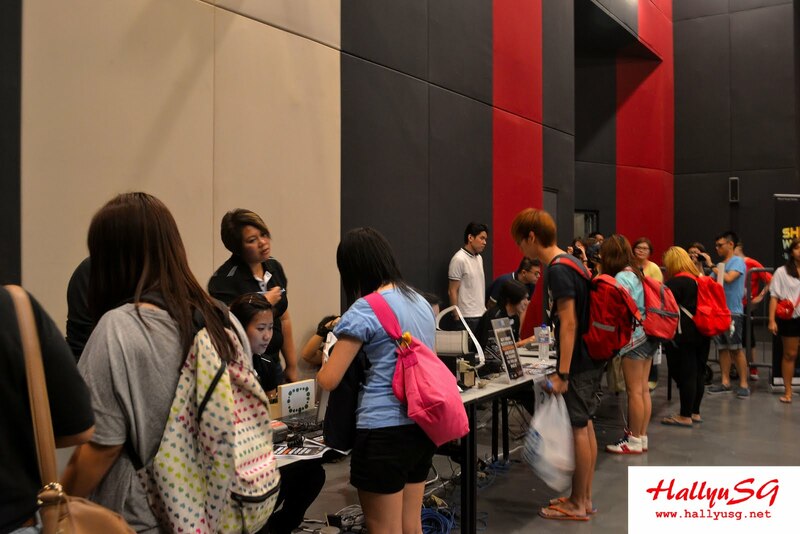 Before the official ticket sale commence at 9am, fans were each distributed a booking form to fill in their particulars and indicate their preferred choice of ticket category in order to speed up the queue when it starts. 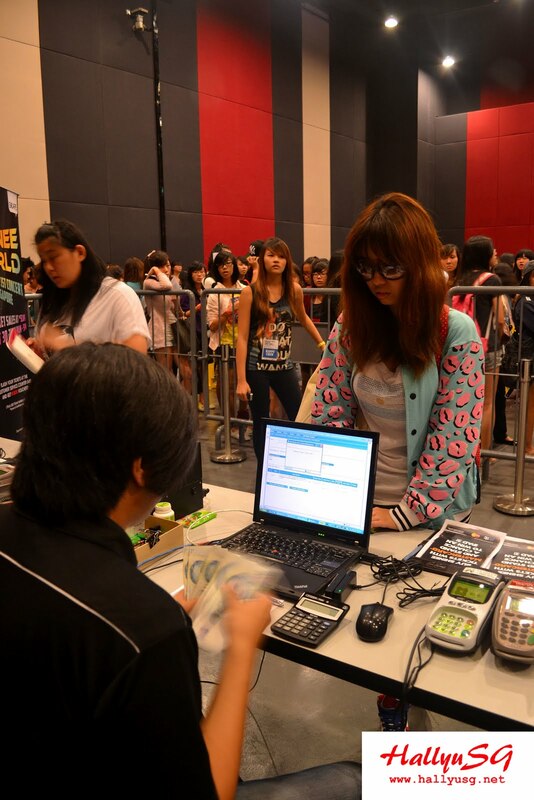 5 SISTIC counters were dedicated at *SCAPE for the purchase of SHINee World Concert tickets and the entire staff members as well as fans were all ready for the sale to commence. 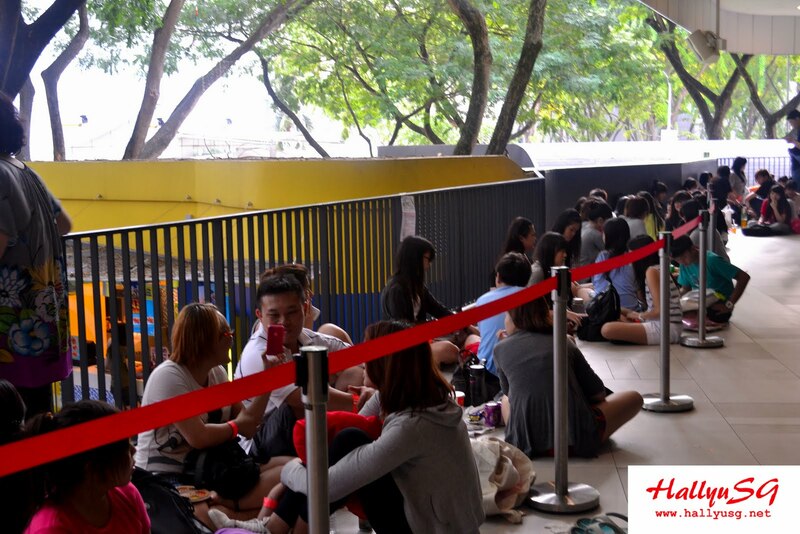 After a long wait, tickets were officially on sale at *SCAPE at 9am sharp and the first 5 fans in line had the priority to purchase their tickets first at the 5 SISTIC counters. 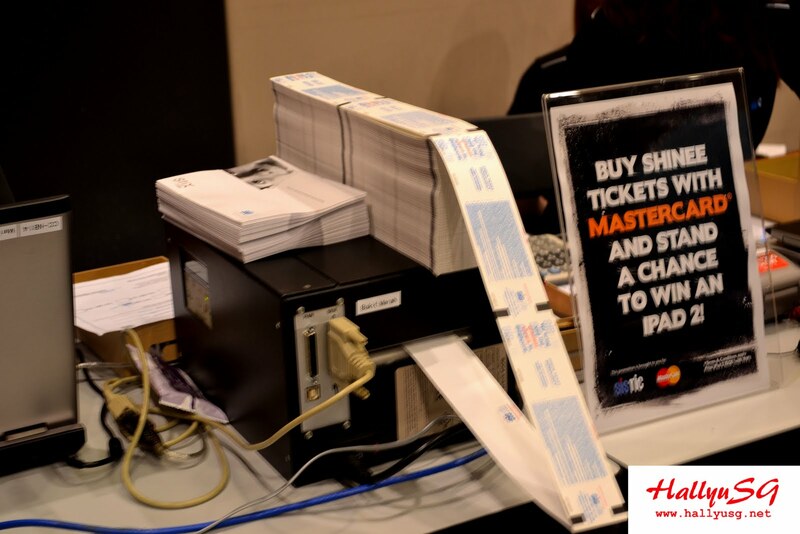 One could easily watch how elated and overjoyed they were when the tickets were finally on their hand. We were as thrilled and delighted as them too! Within a short 45 minutes, all 300 Arena seats were snatched up by the fans. It didn’t took another 3 hours before 90% of the total seats were sold out, which further proves the rising popularity of SHINee across Asia/Singapore. 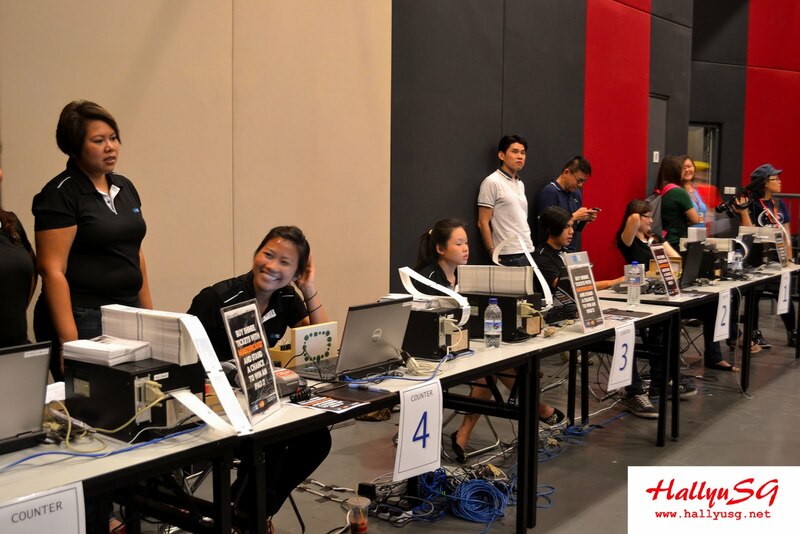 On top of that, the first 300 ticket holders were allowed to redeem and walk away with a S$10 K-Box voucher each from the information counter at *SCAPE. We were glad that everyone in the queue managed to get their tickets to the concert, and for those who haven’t gotten your ticket, you definitely do not want to miss this exclusive solo-concert in September. 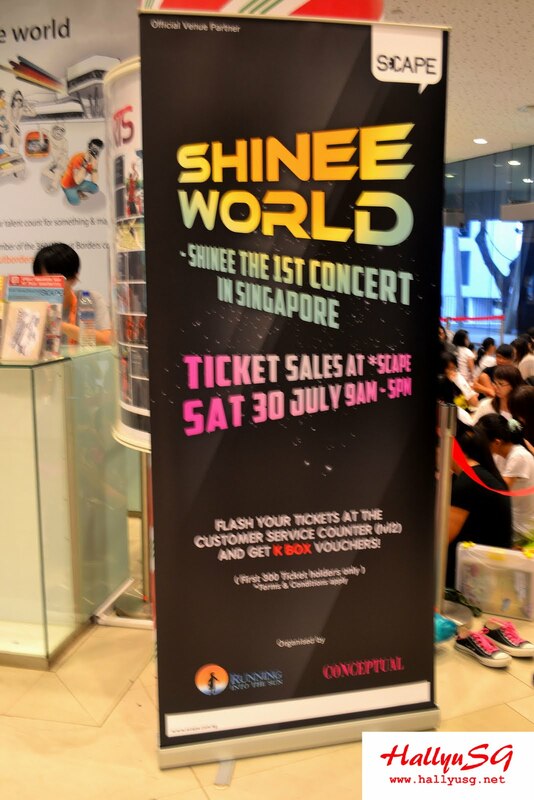 Mark your calendar(s) and start counting down to the day of SHINee World Concert happening in our very own island! 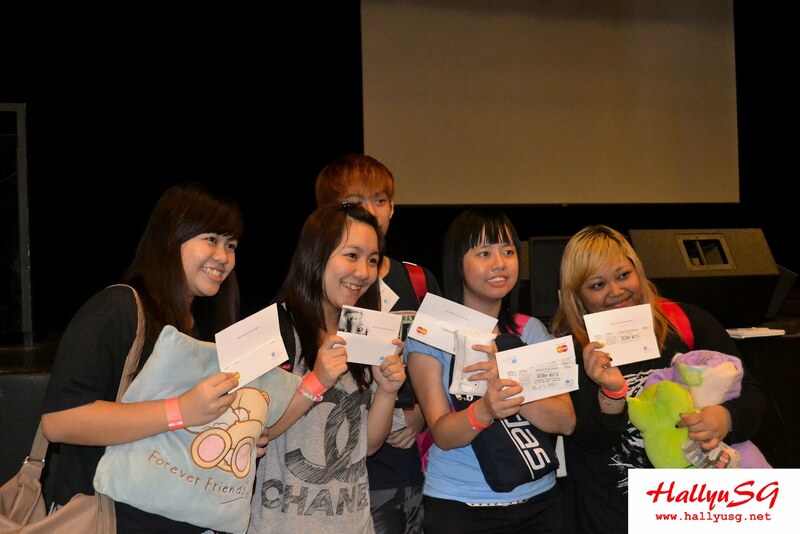 RSVP to the concert at the official facebook event page here! Don’t forget to follow HallyuSG on twitter for your instant updates on the event. Do check out and support Running Into The Sun on facebook and twitter as well!